Mercedes-Benz just unveiled its first, all-electric production bus - the eCitaro that will enter the market later this year. The German manufacturer begins with a relatively small battery pack of 243 kWh for up to 150 km (93 miles) under SORT2 test cycle, but within two years there is a plan to switch to higher-capacity modules (33 kWh instead 25 kWh) and offer 330 kWh packs. The other option under development is solid-state batteries (400 kWh packs) that are to be supplied Bollore's Blue Solution. On the powertrain side, Mercedes-Benz uses 250 kW dual motor portal axle ZF AVE 130. Overall, the Mercedes-Benz Citaro is one of the most popular buses in the world with more than 50,000 sales so far. The electric eCitaro soon will have the opportunity to take a bulk part of Citaro sales. It emits zero local emissions and runs almost silently. It combines the thousandfold proven platform of the world's best-selling city bus with new technological solutions. The all-electric Mercedes-Benz eCitaro takes electric mobility using city buses to a new level altogether. The new eCitaro offers an impressive and unprecedented standard in energy efficiency, courtesy of its innovative thermal management system that uses innovative components available for the first time with the launch of the eCitaro. Its performance enables the eCitaro to cover a large part of the requirements of the transport operators right from the start. In addition, it is ready for the battery technology of the near future – the performance capabilities will increase quickly. At the same time, due to the high development effort and extensive testing, it comes to the starting line already fully matured. In addition, the intelligent modular concept of battery and charging technology is compelling. Its design fuses the basic shape of the Citaro with elements of the Mercedes‑Benz Future Bus into a distinct appearance. It is also more than just a city bus: Mercedes-Benz takes a holistic view of electric mobility, embedding the eCitaro firmly in its overall eMobility system. In addition, the eCitaro is the starting signal on the road to an electric future. Be it a metropolis, a large city or a small town, the challenges and problems are similar: A growing population means a growing need for mobility, both for work and recreational purposes. One possible solution in this respect is a well-developed local public transport infrastructure, with low-emission and locally emission-free buses. The current buzzword is therefore electric mobility. The new all-electric Mercedes-Benz eCitaro is an important element in this regard, running as it does both locally entirely emission-free and almost silently. The platform of the new Mercedes‑Benz eCitaro is the Citaro, the world's best-selling city bus with more than 50,000 units sold. With its wide range of low-emission and now also locally emission-free city buses, it has the right answers to questions about environmentally friendly local public transport. The Citaro and the large-capacity CapaCity bus, as well as the Citaro hybrid and the Citaro NGT, provide practical evidence of the highly sophisticated level of development of powertrains with combustion engines every day. They are characterised by both their efficiency of operation and their low emissions. The all-electric eCitaro is now taking the next step from low-emission bus to locally emission-free bus. The new eCitaro is also a true Citaro – but a very special one. That is because the exceptional characteristics of the new Mercedes-Benz eCitaro correspond to its equally exceptional design. It is based on the familiar looks of the Citaro, but takes up elements from the design idiom of the revolutionary Mercedes‑Benz Future Bus concept vehicle and transports the unmistakable design of the Citaro into the future. This is particularly evident in the face of the eCitaro. The central feature is the Mercedes star. It demonstrates self-assurance with a diameter of 28 cm. Similar to on the Future Bus, trim elements radiate from the star to the left and right. The three-dimensional elements are made of a transparent material and are chromed on the back by means of vapour deposition. This results in attractive lighting effects from different angles and in changing sunlight. The star, the trim elements and the brand badge of Mercedes‑Benz are embedded into the high-gloss black front panel, which also integrates the individual LED headlamps. The model logotype with a blue "e" discreetly and at the same time conspicuously points to the all-electric powertrain technology. The bumper with integrated number plate bracket and the three-dimensionally carved hallmark A0-pillars of the model frame the face of the eCitaro. They are painted in vehicle colour. Another feature of the city bus is its curved windscreen. Visually stretched by the glossy black front panel, it elegantly sweeps up to the roof and integrates the destination display. Visually, the windscreen smoothly transitions into the roof with dark bars on the left and right. At its middle, the roof sports an "island" in vehicle colour that almost seems to float, likewise one of the design elements of the Future Bus. It is not only a visual element, but also forms the end of the roof membrane. The roof-mounted equipment of the eCitaro is hidden behind an elegant roof-edge ridge. It is made of a multi-piece extruded aluminium profile. The glossy black lower segment extends the generous glazing of the city bus. The upper segment is painted in the vehicle colour, transitions smoothly into the A0‑pillar at the front and into the corner post at the rear, and visually frames the side. These optical tricks lend the eCitaro perfect proportions and make it seem light. The rear corner posts end at the top in a pronounced curvature in the roof-edge ridge. Their elegant shape as well as the likewise stylised island as covering for the roof-mounted equipment and the black bars that connect rear window and roof take the heft off the high superstructure. The designers paid attention to details. For example, the shapes of the island correlate with those of the rear hatch. The eCitaro adopts the tail lamps as well as the rear hatch and bumper from the existing model range. Overall, the eCitaro sports a solid appearance with clearly drawn contours and no showmanship whatsoever. It looks friendly and self-assured, open and inviting, and thereby appropriate for its use in city line service. At the same time, the new eCitaro is a true practical bus, an important trait in the daily practice for bus drivers: Despite the changed front end, all sight-lines and mirrors are identical, which makes quick changes between different versions of the Citaro a breeze. The eCitaro adopts the structure of the current model unchanged, a crucial aspect for a preferably simple repair of accident damage, for example. The curved windscreen comes from the Citaro Ü and is thus a common spare part. The roof-edge ridge at the sides is not only a two-piece design, it is also segmented and thus removable in individual sections and consequently especially service-friendly. In the passenger compartment, the eCitaro rings in a general update of the interior of the entire Citaro family of models. A stand-out feature in the interior is the coffered design ceiling above the centre aisle and the sweeping roof-edge flaps. They hide a new air circulation system with textile ducts in place of the current plastic air ducts. They are even easier and simpler to install. Particularly noteworthy are the technology modules as connectors between the individual elements of the coffered ceiling. They combine the interior lights and the loudspeakers in one element. With this step, the interior lights are switched to LED as standard. The lighting is ingenious: The light of the LED lamps is refracted in a way to make the technology modules appear to the observer as one homogeneous light panel. In addition to the closed look and the new interior lights, the advantage of the new ceiling is a significantly reduced number of individual parts. Together with the new air circulation system, this lowers the already low interior noise in the passenger compartment even further, which means more comfort. Also new is the black trim on the sills and window posts. As a result, the window posts stand out less and the appearance of the side walls is calmed. While the new exterior was designed and developed exclusively for the eCitaro, Mercedes‑Benz will transfer the changes in the interior to the entire model series. The powertrain of the new eCitaro is based on the proven and optimised electric portal axle ZF AVE 130 with electric motors at the wheel hubs. The peak output of the motors is 2 x 125 kW, while torque is 2 x 485 Nm. It is an inherent feature of such motors that this is fully available right from the start, ensuring appropriate dynamic performance even with a full complement of passengers. Lithium-ion batteries with a total capacity of up to about 243 kWh provide the power. They are modular in design: the batteries are split between up to ten modules, each supplying around 25 kWh. As well as two battery modules on the vehicle roof, the standard equipment includes four modules in the rear of the bus. In the eCitaro, these are taking the place of today's powertrain combination of combustion engine and transmission. Depending upon customer requirements, another two or four battery modules are mounted on the roof of the eCitaro. Each battery module is made up of 15 cell modules as well as a control unit for monitoring purposes and as a means of balancing the charge of the battery cells. Each separate cell module houses twelve battery cells. Mercedes-Benz uses easily manageable prismatic cells with a capacity of 37 Ah each. With a minimum of six and up to a maximum of ten possible battery modules, transport operators can adapt their usage and charging strategy very precisely to individual needs. Opting for the largest number maximises the range of the buses, while a smaller number reduces the weight as well as the cost of purchase and allows more space for passengers - but potentially makes time-consuming opportunity charging necessary. With the maximum complement of ten battery modules, the eCitaro in standard specification weighs around 13.44 tonnes. In conjunction with a gross vehicle weight rating of 19.5 tonnes, this corresponds to a payload of more than six tonnes or around 88 passengers – in line with what is needed in practice even during rush hour. The eCitaro's charging technology also allows it to adjust to the individual wishes and requirements of the transport operators. For the start of series production, plug-in charging is intended. To this end, the city bus features a socket for a Combo-2-plug above the front wheel arch on the right-hand side of the vehicle in the direction of travel as per the provisions of the German Association of Public Transport Operators (VDV). This ensures the simplest, fastest and at the same time cheaper power supply variant. If opportunity charging is required to extend the range, there will also be an option to charge the eCitaro via a pantograph in future. This option will be gradually phased-in once series production has started. There will be two possible variants: in phase 1, an integral pantograph on the roof; in phase 2, charging rails on the roof that will allow charging via a stationary pantograph of a charging station. In both cases, the installation space will be level with the front axle. This intelligent modular concept of battery and charging technology means that Mercedes-Benz is able to offer transport operators the opportunity to configure the eCitaro precisely to the individual requirements of the company or even of individual routes. In addition, the eCitaro is also able to generate electrical energy through an energy recovery process. In this case, the two electric motors at the wheel hubs of the drive axle act as alternators during braking, transforming the kinetic energy of the vehicle into electricity. However, the battery capacity alone provides little indication of the actual performance capability and, above all, the range of an all-electric city bus - the true measure is that of energy consumption. In the case of a city bus, this is impacted significantly by climatic conditions and consequently by the need to cool and, above all, to heat the interior. At an outside temperature of minus ten degrees Celsius, the energy consumption of a city bus doubles compared to journeys where no heating is required - thereby cutting the range by half. The cause: The extreme efficiency of an electric motor means that, compared to a combustion engine, the amount of usable waste heat is negligible. The heating system must therefore be fed from the vehicle's own energy supply. In addition, there is the large interior and the frequent opening of up to three double-wide doors at bus stops that let in outside air. The engineers have therefore put a considerable amount of thought into the issue of thermal management. It is one of the outstanding features of the eCitaro and has been honed and refined in every detail: Compared with the current Citaro with combustion engine, the energy requirement for heating, ventilation and climate control has fallen by about 40 percent. This exceptional energy efficiency provides the basis for the eCitaro's practical operating range even under unfavourable conditions. This is accomplished with the use of innovative components that only reached market readiness in concert with the eCitaro. Here too, thermal management is important. Mercedes-Benz, for example, cools the batteries to ensure that they remain at the ideal temperature, thereby ensuring maximum charging capacity, performance capability, and service life. This cooling is undertaken by a separate battery cooler mounted on the roof. At extreme outside temperatures, the standard passenger-compartment climate control system is used to boost the cooling of the batteries. The passenger compartment of the eCitaro is heated in an energy-efficient manner by a heat pump. An even temperature distribution is ensured by use of the familiar sidewall fan heaters. The conventional heater at the front is boosted by the addition of a double heat exchanger. For selective use in extreme weather conditions in the range of minus ten degrees Celsius and below or to extend the vehicle's range, a fuel-powered auxiliary heater can optionally be used. A series of examples makes clear the care and detailed attention that have gone into the thermal management system. All components that give off heat are linked together, so keeping the amount of energy required for their cooling while in operation to a minimum. Since the human body likewise gives off heat, the heating on a bus carrying a full complement of passengers can be turned down earlier. Furthermore, Mercedes-Benz varies the output of the heating and climate control systems according to the number of passengers on board: the intake of fresh air in the bus is matched to the current number of passengers. The capacity utilisation of the bus is measured via its axle load sensors. During the colder months, the roof-mounted air conditioning system is used in addition as a heat pump, so ensuring effective and efficient climate control for the passenger compartment. The use of CO2 as a coolant brings further benefits. It impresses with a particularly efficient use of the heat pump, even at very cold temperatures as low as minus ten degrees Celsius. Another boon: the interior can be conditioned up to and even beyond the desired temperature while the batteries are still being charged at the depot. The bus will therefore have been heated or cooled to reflect the season before it sets off. The heating and climate control systems are configured in accordance with the requirements of the Association of German Transport Operators (Verband Deutscher Verkehrsbetriebe (VDV)). If the temperature outside is extreme, comfort levels at either end of the scale are reduced somewhat in favour of energy consumption and thus range. Instead of the interior temperature being set to a consistent level all year round, it is adjusted according to the situation to ensure the comfort of passengers. As passengers generally spend only a short time in the vehicle and are normally dressed in accordance with the time of year, the inside temperature is set higher on hot summer days and lower on cold winter days, without at any point compromising passengers' feeling of comfort. When it comes to the driver's workplace, Mercedes-Benz pursues a somewhat different strategy: since the driver spends all his or her working hours on the city bus, the requirements here are greater. Driver-fitness safety must also be ensured at all times. That is why the climate control system for the driver's workplace is controlled separately, with a target temperature of 24 degrees, even in extreme outside temperatures. Operating range figures for all-electric-powered city buses are often difficult to compare and caution is advised, since reference values can be missing and the figures have often been calculated under ideal conditions. Things are different with the eCitaro: In the interests of reliable data, Mercedes-Benz prefers to consider a "worst-case scenario" and therefore takes its direction from the challenging standardised city driving cycle known as SORT2. To make things even trickier, Mercedes-Benz also adds the energy requirements of the ancillary consumers into the equation. According to SORT2, the Citaro with a full complement of batteries achieves an operating range of around 150 kilometres in the summer. In other words, it is already possible to serve some sub-networks within the daily workload of a city bus without opportunity charging. Without opportunity charging, the eCitaro already covers about one third of all requirements of the transport operators. In other words, it can seamlessly replace one in three city buses powered by a combustion engine. Under ideal conditions, the eCitaro even drives around 250 kilometres without opportunity charging. The downside of all-electric city buses is the extra weight added by their batteries. Even the intrinsically lightweight Citaro is unable to completely offset the 2.5 tonnes of the largest battery set. However, with a carefully considered weight distribution, the eCitaro is able to make full use of the permissible axle loads to ensure the highest possible payload and thus number of passengers. The engineers managed to balance the bus by installing four battery modules in the rear overhang and up to six further battery modules on the roof, on the level of the front axle. This axle is also characterised by a maximum load-carrying capacity of eight tonnes and thus, depending on the variant, the practical complement of around 88 passengers. Since the developers have adopted the tried and tested layout of the Citaro, the configuration of the passenger compartment remains unchanged compared with the conventional Citaro with vertically mounted engine. Passengers will find everything familiar. The vehicle is available with either two or three doors. Another advantage of the Citaro platform: transport operators are able, as ever, to individualise the bus by selecting from a wide range of optional extras. Be it passenger seats, flooring, grab rails, communication systems or invisible details such as the door controls - the Citaro is and remains a tailor-made city bus. The driver of the eCitaro has to adjust just as little as the passengers. Cockpit and operating concept of the city bus are largely as unchanged, the direction of travel is selected as before with the D‑N‑R push buttons. Only the instruments have been modified: A power metre replaces the rev counter. It displays the current power demand and/or energy recovery rate. The driver also receives information about the state of charge of the batteries. He can access the range, available power and a charging indicator on the central display. The nearly identical operation compared with the Citaro with combustion engine therefore permits the usual quick driver change. In addition, the eCitaro supports its driver in energy-saving driving with an acceleration control system: It starts from the bus stop or the traffic light always with identical dynamics under full load, regardless of whether it is empty or fully occupied. This trick prevents an unnecessarily high energy consumption and at the same time results in a gentle, passenger-friendly driving style. In general, the performance is optimised for maximum efficiency, without the driver having to deal with major differences from the Citaro with combustion engine. For example, in the basic setting, the bus coasts in an energy-efficient manner when the driver takes his foot off the accelerator pedal, it "sails". Alternatively, the driver can set a basic deceleration rate – similar to the engine braking torque or the retarder effect of a diesel bus – as the energy recovery rate by means of a multi-stage electric brake lever. The eCitaro comes to the starting line already fully mature. Its superb quality is guaranteed by the tried and tested Citaro that is already in such regular use. In addition, it is manufactured at the company's bus plant in Mannheim, on the production line for the conventionally powered Citaro - where the test vehicles were already built. Key components such as the drive axle and the electrohydraulic steering system have already proved their worth in the challenging world of city bus transport. The design of the roof, with integrated heavy-duty rails for the batteries, is derived from the system used for the gas tanks of the Citaro NGT. What is more, by the start of series production the all-electric eCitaro will already have been through a comprehensive testing programme. This bus had to pass all the same tests as any other bus that bears the three-pointed star, for the eCitaro will offer the same high level of availability and proverbial reliability of its stable mates with combustion engine. All components were tested individually as well as in interaction with others, on test benches and in practice in the bus. Mercedes-Benz has tested the eCitaro at temperatures below minus 15 degrees Celsius at the Arctic Circle and at more than 30 degrees Celsius in the searing summer heat of Spain. Winter testing also included road tests on slippery roadways to test dynamic handling control systems and energy recovery. Summer testing took place in challenging city traffic conditions and on steep climbs and descents in the Sierra Nevada. The test programme also included rough-road and endurance testing. All in all, a dozen or so prototypes were very thoroughly put through their paces. This effort takes time, but results in a high level of maturity already at the market launch of the eCitaro. As is true for every Mercedes‑Benz, the focus also was on safety: As a result, the eCitaro passed a rear-end crash test, for example. It simulated a passenger car impacting the side of the bus in the area where the batteries are installed. 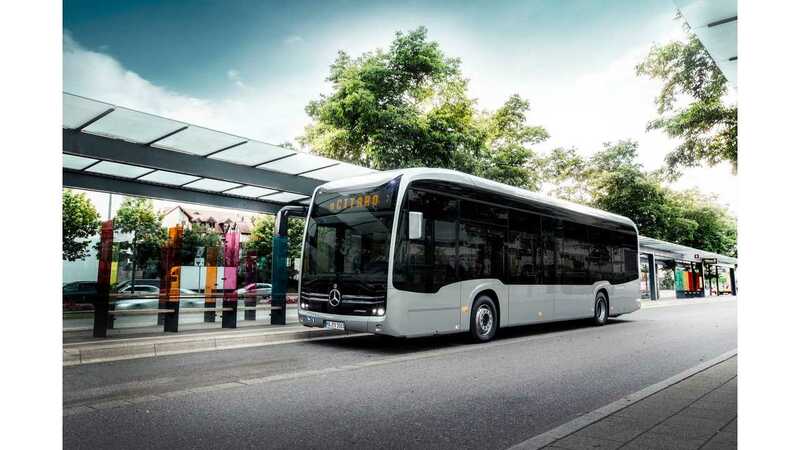 Because Mercedes‑Benz takes a holistic approach to electric mobility, the testing went far beyond intensive vehicle testing: The engineers also evaluated the compatibility of the bus with different charging systems. This resulted in assessments and recommendations for an optimal interplay of the technology of vehicle and infrastructure. It ensures the eCitaro communicates in accordance with ISO 15118 standard, with the charging station communicating with the control unit of the eCitaro. The countdown for the new city bus bearing the three-pointed star is running at full steam: The eCitaro will celebrate its world premiere for the public at the IAA Commercial Vehicles in Hanover in September 2018. First customer deliveries will also start still before the year is out. Rhein-Neckar-Verkehr GmbH will be the first customer for the all-electric city bus from Mercedes-Benz. The first vehicles will be delivered at the end of 2018 and go into practical operations in the Rhine-Neckar metropolitan region. Initial major orders have already been received even before the official premiere of the eCitaro: Mercedes-Benz will deliver 20 of the new all-electric Citaro city buses to Hamburger Hochbahn AG. The first two units will be handed over before the end of this year. Berliner Verkehrsbetriebe (BVG) already ordered 15 eCitaro buses. The new Mercedes‑Benz eCitaro of the year 2018 is the kick-off for an innovation initiative with a clear strategy aimed at the swift and above all practical electrification of public transit with buses in cities and population centres. The eCitaro will be able to replace city buses powered by a combustion engine nearly completely in just a few years. Key requirement for the clearly defined development steps of the eCitaro: its technology is future-proof. Without opportunity charging, the new eCitaro of the year 2018 already covers about thirty percent of all requirements of the transport operators. In other words, all-electric city buses bearing the three-pointed star can already be used today on about one third of all city bus routes solely with charging at the depot, and replace buses with combustion engine. Since the development of battery technology is progressing at a rapid pace, the eCitaro is already designed to be transitioned to the future battery technology. For example, this involves the lithium-ion batteries with lithium nickel manganese cobalt oxide cells (NMC) currently in use. On the eCitaro, they are characterised by a balanced mix of energy density and simultaneous quick-charging capability. The next generation of NMC batteries with larger capacity and resulting increased range will be provided to customers of the eCitaro after reaching production readiness. This will be already two years from now, as things stand today. With 33 kWh per battery module and a resulting total capacity of up to 330 kWh, the eCitaro will then cover about 50 percent of all applications. This greater battery capacity also makes a meaningful introduction of an eCitaro G articulated bus with a reasonable range possible. Because the future NMC batteries and the batteries in use today have identical geometries and connectors, transport operators will even be able to increase the range of the existing eCitaro buses by swapping out the batteries at a later time and thereby further increase the operational flexibility. In parallel to this development, another step is already preordained during that same period, the optional use of future lithium-polymer batteries. They also belong to the class of lithium-ion batteries, but here the usually liquid electrolyte is in a solid state, which is why they are also referred to as solid-state batteries. Solid-state batteries are characterised by an especially long service life and high energy density. With a rated battery capacity of about 400 kWh in the solo bus and even more in the articulated bus, the eCitaro will then meet about 70 percent of all requirements without opportunity charging. The characteristics of solid-state batteries differ significantly from NMC batteries: They have a different shape, are more voluminous overall, are not interchangeable with NMC batteries and not suitable for quick-charging. As a result, city buses equipped with them cover different operational profiles. For this reason, the eCitaro will in future be offered with a choice of NMC or solid-state batteries. Subsequently, the range of the eCitaro will be increased yet again by a range extender in the form of a fuel cell that generates electricity. It will be designed to allow the eCitaro to fulfil nearly 100 percent of all requirements on city buses. This technology eliminates the need for opportunity charging and the complex infrastructure required for it in almost all cases – the eCitaro will be able to replace city buses with combustion engine virtually one to one. The development of a marketable city bus transport system using solely battery power takes place via the "SAEBEL" project, funded by the German Federal Ministry of Transport and Digital Infrastructure as part of the electric mobility funding policy with a total of 1.85 million euro. The implementation of the funding policy is being coordinated by NOW, the German "National Organisation Hydrogen and Fuel-Cell Technology“. Results of the various funding activities of the BMVI in the context of local public transport are combined within the programme support research as part of the working group "Innovative Powertrains Bus". To accelerate the market development for the eCitaro with fuel-cell technology as a range extender, Daimler Buses aims for funding as part of the German "National Innovation Programme - Hydrogen and Fuel-Cell Technology" (NIP).